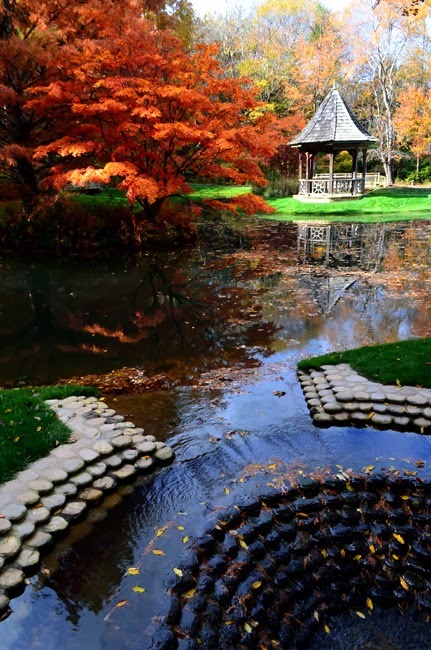 I guarantee you will be beyond amazed and in a state of awe when exploring Gibbs Gardens during their "Japanese Maple Festival"—this being their first annual of the extraordinary event. Barry and I went this past Saturday, for quite a few hours...we had an incredible day! Since then, it's been an super busy week and it'll be a little longer before I get to post photos (between the two of us, we made more than 2,000 photographs! ), but I wanted to give you at least a single-photo "preview" and let you know that this weekend is the "peak" of the 2,000 Japanese Maples in Gibbs Gardens...most of them in the 40-plus acre Japanese Garden, but they're throughout the Garden, and there's more than 100 varieties. Several of our friends and colleagues are going to be visiting Gibbs Gardens this weekend...I hope you'll be among them. In the meantime, you can expect quite a few photos—quite a lot indeed—in the not-too-distant future and a story about a wonderfully magical place...not too far from Atlanta.